"I’d rather stick needles in my eyes! ", Michael Ball said about plans for a return to the Eurovision song Contest, where he in 1992 sung the UK entry One Step Out Of Time to a second place. Despite that, we can still enjoy his new album. 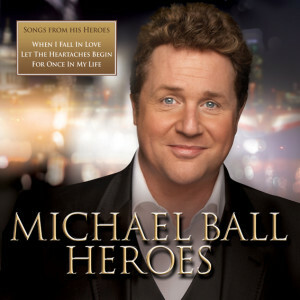 This review is about the spring release of Michael Ball’s album “Heroes”. It’s not new songs, Mr. Ball gives on this almost 1 hour long CD his interpretation of 15 songs from the 1950s, 60s and 1970s. Not that he changed a lot from the original, he is simply giving new life to songs on their way to be forgotten. And he does it more then well, because it so clear to hear that Michael Ball’s voice is on its peak of his career, beeing one of Brittain’s most loved musical stars he is not a singer on his way down or without new inspiration, which in my opinion often is the case when CD’s like this are put on to the market. Not that there is anything wrong in doing that, in fact its good to hear yesteryears hits again, they bring back memories from one’s childhood and teenage days. Now lets work our way through the album. 1: Let The Heartaches begine. Classic late 1960s ballad originally with Long John Baldry who became #1 in the UK in 1967. 2: I’ll Never Fall In Love Again. A #1 hit with Bobbie Gentry in 1969, written to the musical Promises Promises. A great love song, with the big orchester. 3: Play Me: Niel Daimond became #11 in the US in 1972 with this lovely romantic simple song so typical for the 1970s. 4: Summer Wind: In 1965 this tune became #78 with the singer Wayne Newton, but peaked the charts when Frank Sinatra made his version of this Big Band song. The Danish duo Grethe and Jørgen Ingmann, winner of the 1963 Eurovision Song Contest, also made a version of it, and that became a bigger hit for them in Scandinavia. 5: For The Goodtimes: In 1970 US country singer Kris Kristofferson released his debut album, Kristofferson, and included this song on it, earning him a #1 on the country chart plus best country song of the year. 6: Misty: Johnny Mathis became #12 in the US with this Jazz standard written by Erroll Garner, and later with lyrics added to it by Johnny Burk. Maybe the best song on the album. 7: When I Fall In Love: Was form the 1952 film One Minute To Zero and sung bay actress/singer Doris Day and peak as #20 on the US Billboard. Later also a hit with US singer Nat King Cole its a lovely slow ballad. 8: You Dont Know Me: A simple love song, originally preformed by Jerry Wale who became #14 in 1956. Six years later the same song, now with Ray Charles, reach #2 on billboard. 9: Weekend In New England: Barry Manilow got him self a #1 hit one the Easy listening charts in 1976 with this build up pop ballard song. I prefere Manilow’s version. 10: New York State Of Mind. After the 9/11 attack this Billy Joel song from 1976 became a major hit. Its a great 70s tune, there in this version opens up with a few cords from Gerswins Rhapsody In Blue. 11: Joanna: Became #7 on the UK chart in 1968 sung by Scott Walker. 12: Can’t Help Fallin In Love: Not a hit for Elvis Presley when it was included in his 1961 film Blue Hawaii, but certenly one of his most loved ballads. This version is true to the original and showes Michael Balls great voice. BTW. UB40 went #1 with a regga version of it in 1993. 13: He’ll Have To Go: Jim Reeves became #1 on the US country charts in 1959. 14: For once in My Life: Jean DuShon released a slow version of this song in 1967, That version vanished almost, when Stevie Wonders made an uptempo version a year later. 15: Avenues And Alleyways: Originaly with Tony Christie, and here in a duet with him and Michael Ball. The song apered in the 1972 TV series The Protectors. This is a collection of classic songs which offers a great variation. It is an album which shows exactly that these songs still last and Michael Ball is just the man for such interpretations. Absolutely worth buying!